At approximately 12:30 on Thursday, 19 April 2012, a 20 year old male, Mr David Lilienfeld was bitten by a Great White Shark at a popular surfing area known as “Caves” at Kogel Bay. The victim suffered the loss of his right leg and died in the water. Mr Lilienfeld was a member of the South African Bodyboarding Team. Provide a detailed account of the event for the record. The following account of the events leading up to the attack, the attack itself, as well as the emergency response has been compiled based on interviews conducted on 19 April 2012 with all relevant parties and eye-witnesses. Although the accounts from various witnesses vary to some degree, as is to be expected following a traumatic event, the following can be considered an accurate description of the events leading up to the fatal attack, as well as the emergency response thereafter. “Caves’” is a popular surfing area on the Northern-most end of Kogel Bay. It is a small cove located under steep cliffs, closest to the Gordon’s Bay side of the bay. The two body-boarders (confirmed as brothers David and Gustav Lilienfeld) had been in the water for less than 10 minutes. They were facing the sea beyond the breakers. The shark made three passes at Mr David Lilienfeld. Only on the third pass did the eye witness see blood surrounding the victim indicating that the first two passes did not cause injury to the victim. This is further confirmed by reports from the responding NSRI member who observed no additional injuries to the victim. After the final strike, the shark moved away from the victim and did not approach the victim again. Following the fatal strike the victim was motionless, indicating a severe attack that left the victim helpless and lead to his almost immediate death. Eye witness accounts indicate that Mr Lilienfeld’s brother (Gustav), who was body-boarding with him at the time of the attack, tried in vain to reach and assist his brother. The two were however separated by strong wave action. As he was unable to reach his brother, Gustav Lilienfeld left the water. The waves and the current washed the body of the victim towards the shoreline. Mr David Lilienfield’s body was pulled onto the rocks by bystanders. The first emergency calls were received at 12.40pm. At 13:00, the NSRI arrived on scene by road and air and reported that the victim’s body was on the rocks at the base of the cliff. The NSRI took control of retrieving the body of the victim, as per standard protocol. The NSRI dispatched one of their vessels, as well as a helicopter, to assist. Due to the difficult location of the victim’s body and the proximity of the cliffs, the medevac helicopter was unable to retrieve the body and returned to base. At this point both the skipper of the vessel, as well as the helicopter pilot, reported the presence of two white sharks in the area. At 15.10 pm, the victim’s body was recovered from the rocks by ground personnel and carried up to the road. The victim’s father and brother were on scene throughout the recovery of the body. Undertake witness interviews and investigate the events before, during and after the attack. Once the team had been notified and dispatched, ERMD then notified the Sport, Recreation and Amenities (SRA) Department at 13:18 and requested that SRA assist in closing the beach to swimming with the assistance of their District Staff. SRA immediately arranged for the closing of the beach, and also confirmed the closure. A media release was issued informing the public. The Department of Environmental Affairs Oceans and Coasts Branch was also notified. The White Shark Flag, indicating a closed beach due to shark activity, was raised at the main gate at Kogel Bay Resort, where visitors were advised of the beach closure at 14:45. A shark spotter was deployed to the “Cave” beach area and remained on site to actively inform the public. The shark spotter retuned to the “Cave” beach area on the morning of 20 April 2012 to continue ensuring beach closure. At the time of the attack, seas were calm with a 3-4 foot swell running, the water was “green and clear as described by the witness,” water temperature was 19 degrees, the sky was cloudless and the wind was mild south-easterly breeze. The eye witness also reported that just before the attack, a pod of 30 dolphins had moved through the area, as well as the presence of a number of actively feeding birds. At the time of the attack only the two body-boarders were in the water. The area in which the shark attack took place is well known for White Shark presence, especially at this time of the year. Sightings of White Sharks by surfers at “Caves” and Kogel Bay are regularly received by the City’s Environmental Resource Management Department, as well as the Shark Spotters website. A breaching shark was reported two weeks ago and ERMD have also received reports of sardine activity. Further unconfirmed reports from construction workers who were in the area indicate that two White Sharks had been seen in the area an hour before the attack. A non-fatal white shark attack occurred at the same area in July 1999 (prior to City actively keeping records). In 2006, the City and the Shark Spotting Programme initiated a trial of shark spotting at “Caves”. This was unsuccessful as the logistics of deploying shark spotters to an area without public transport access, or within reasonable cycling or walking distance of a major centre, resulted in the trial being suspended. The City has deployed Shark Smart information signs across its coastline in 2010. These signs have been installed at all nodal points. 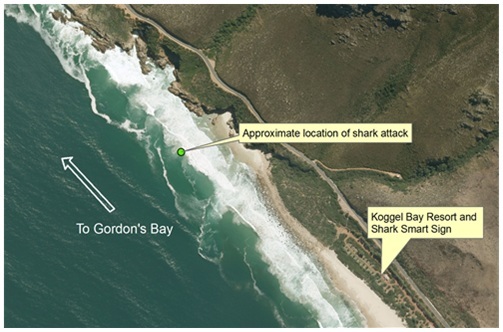 Site inspection on the 19 April 2012 confirmed that a Shark Smart sign is present and visible at Kogel Bay Resort. However, no sign is present at the access point to the Caves surfing area which is on the northern end of the bay. 1. Could the attack have been avoided within reasonable means? Kogel Bay is a relatively remote area with little infrastructure and no permanent presence of City staff or services. The amenity function and services are located at the southern end of the bay at the Kogel Bay Resort. White Sharks are known to frequently use this area, especially during the summer inshore period (late August to early May). The presence of a pod of dolphins just prior to the attack as well as birds feeding beyond the shoreline is indicative of general feeding activity in the area and thereby indicates an increased likelihood of shark activity. Considering all the above, it is the view of this report that the fatal shark attack could not have been avoided within reasonable means. Cape Town is a city of 3,5 million people residing along a coastline which forms the natural habitat for White Sharks. An unfortunate, tragic and regrettable result of this will be that, on occasion, shark attacks will occur. “The exercise took place at Seal Island – very close to the northern end. I was on board from 15:00 to 19:30. There was a fairly brisk westerly going south westerly blowing which later dropped off. The chumming was much less than anticipated. A tuna head dangled off the stern and a mixture of crushed pilchards in water was intermittently ladled overboard. It could not have been more than 30l that was used in the time I was there. The small boat hooked a +-3.9m female with a baited hook and brought it alongside and onto the cradle. The sampling and measuring took 13 minutes in total. The following critical point needs to be stated. During the attack the sharks dorsal fin broke the surface (as reported by the eye witness Mr Marais). If this shark had been one of the tagged sharks, the satellite transmitter would have given off a signal that would have been recorded on the system and located the shark at Kogel Bay. On assessing the data, no satellite records exist for that area. Two of the sharks tagged in False Bay have given off signals and were located in the Macassar/Strandfontein area shortly before the attack. The lack of satellite signal is clear information that the shark involved in the attack is not one of the sharks tagged by the Ocearch Research Programme. Further, with regard to public speculation of the role of chum, the following should be noted. White sharks occur in False Bay in healthy numbers throughout the year. The small and limited chumming by Ocearch would not have attracted additional sharks to False Bay as the amount of chum used is insignificant in comparison to natural chum sources in the bay including the natural chum slick emanating from Seal Island, fishing activities in False Bay, by-products from Kalk Bay harbour as well as the small and immaterial chumming by permitted cage divers. Furthermore, the Ocearch Programme operated in False Bay at Seal Island on Sunday and Monday. The wind direction has been strong south east throughout the week. Any residual chum from their activities would have dissipated within hours and, due to the wind direction, moved from the island in an opposite direction to that of Kogel Bay. As a result, there is no evidence or reason to suggest that the tagging of four White Sharks over a period of 24 hours from Sunday 15 April to Monday 16 April, in False Bay, by the Ocearch Programme had any role to play in the tragic events that occurred at Caves. Although the City has, and continues to have, no role in the Ocearch Programme, as well as not feeling that it is appropriate, or required, to defend or support the programme, it holds the view that it is essential that the correct and factual information be provided to the public. Public and media speculation linking the two unrelated activities is uninformed and misleading. Source: City of Cape Town. As sad and unfortunate as this incident is, I am glad to see that the Osearch Programme has been found to play no part in this event. The work they are doing is imperative in studying, understanding, and ultimately saving sharks. It would be ludicrous to withdraw their permits and shut them down because of a shark attack in a neighbouring area. Sharks mistake humans for food sometimes. Notice that in the report, the shark made 3 passes on the bodyboarder. It was on the 3rd pass, that the shark bit the young man, and it did not bite him further. Surfers etc need to be smarter when out in the ocean. They should always have a spotter watching the water and go out in groups. I know young people think they will live forever and don’t often think of the danger they put themselves in, but maybe this young man’s unfortunate demise will teach others to use their common sense.